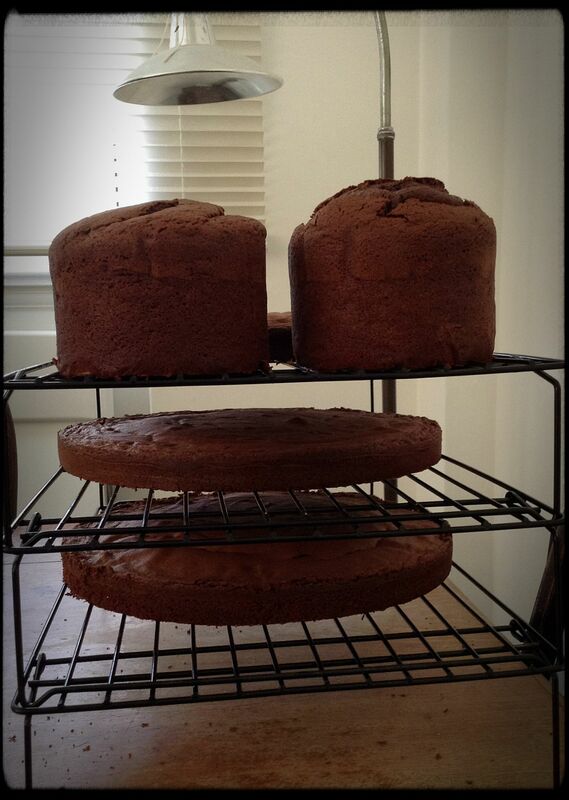 I baked this in two batches because there was only room in my oven for two 26cm tins at a time (and I imagine my mixer might’ve struggled to accommodate a double batch). 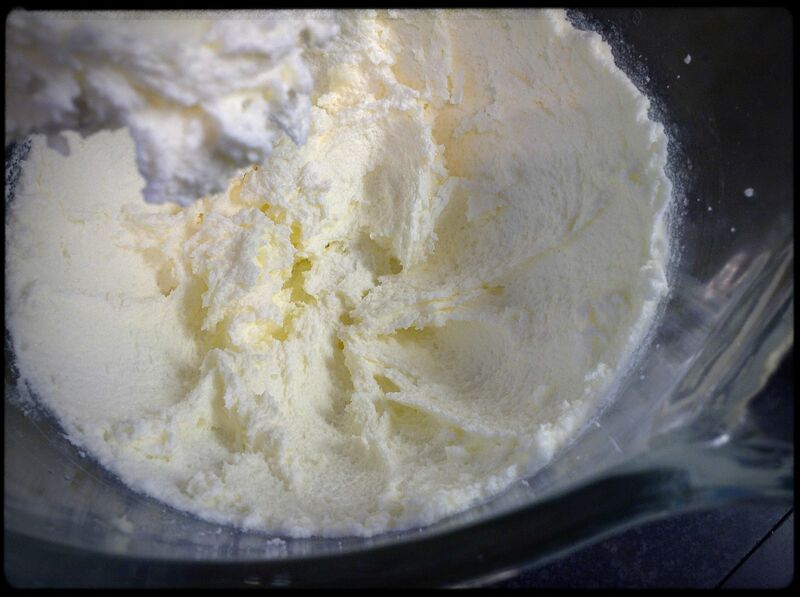 In a separate jug, break up the eggs and vanilla with a fork, then add it to the butter/sugar one tablespoon at a time, beating thoroughly between each addition. 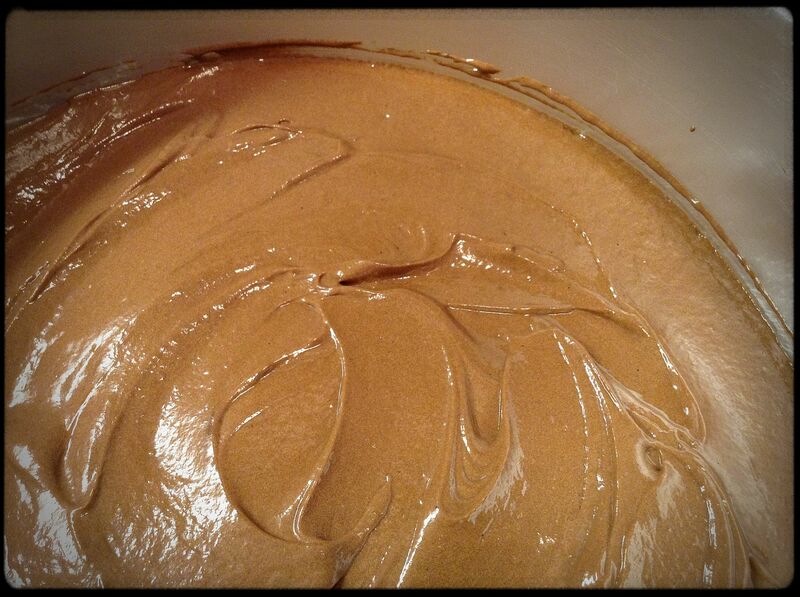 Fold in the flour in three batches, alternating with the soured cream. Go easy on the beating at this stage. 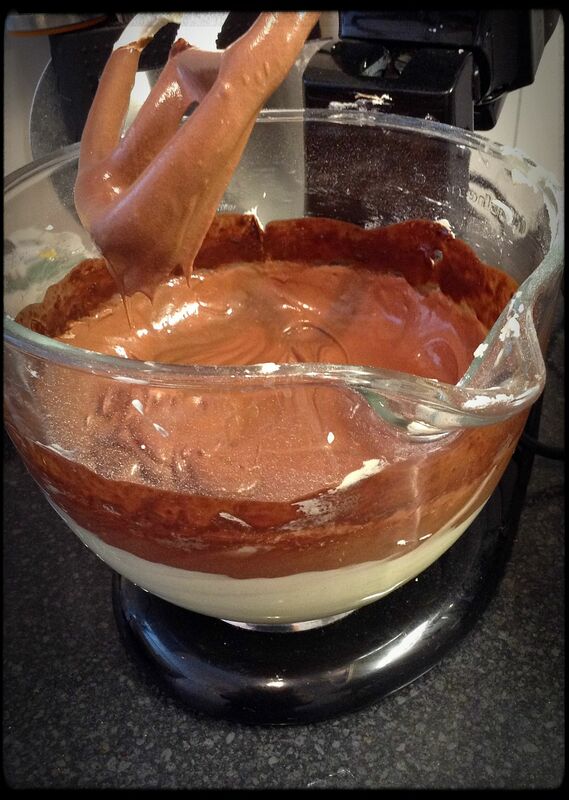 Mix the cocoa liquid with the melted chocolate (and resist the urge to lick any errant chocolatey goodness from your fingers – the bicarb does not a tasty experience make) then fold it in to the cake mixture. 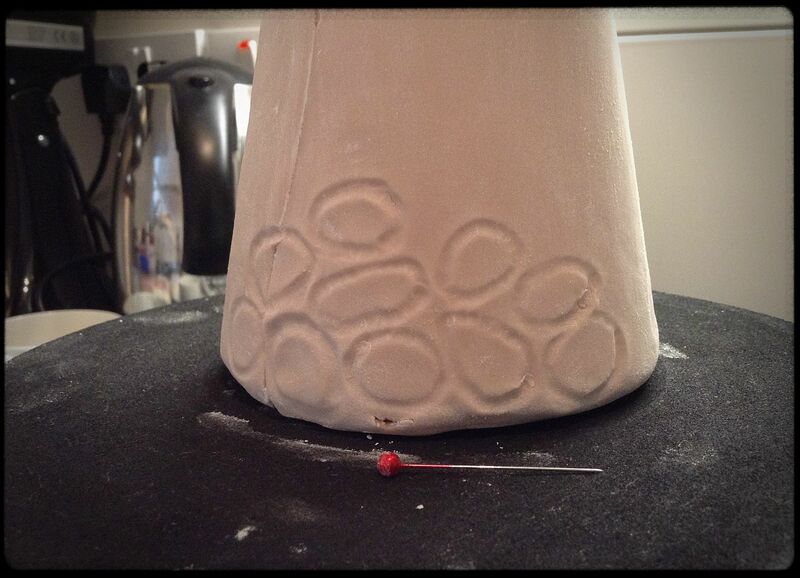 Make sure you do the skewer test before turning onto a wire rack to cool. 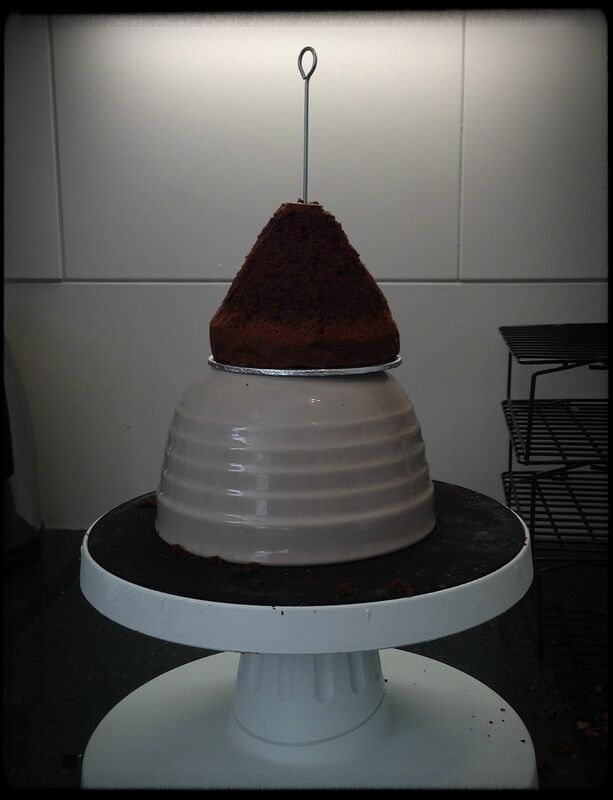 Initially, I was determined that the entire cake would be edible, but a little guiding voice popped into my head (as it did on a number of subsequent occasions – usually when my quest for perfection had spun out of control). That phrase? 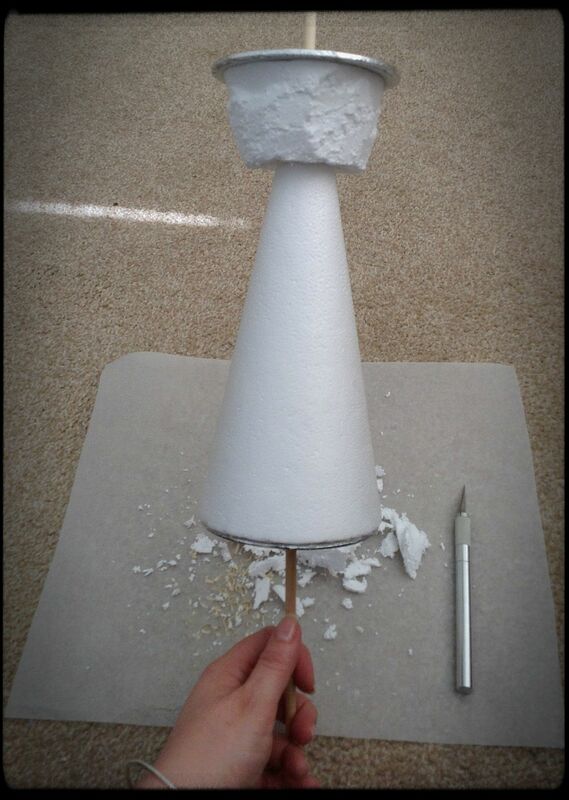 Instead, I opted for a more sensible mid-section structure of polystyrene, which also meant I didn’t have to bake a random conical cake. 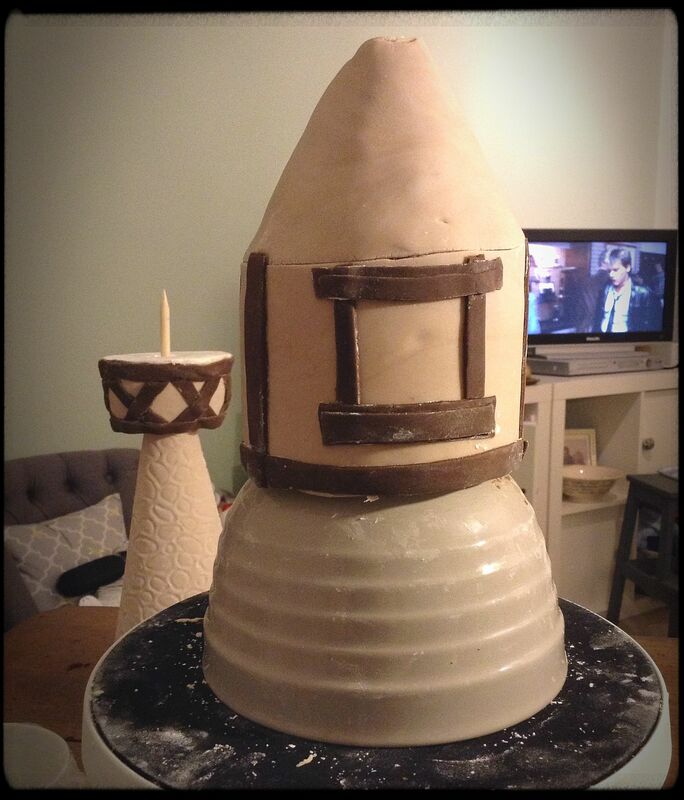 So, in terms of scaffolding, we have a wooden spike at the bottom that was eventually hammered into the base board to make sure nothing tilted nor toppled, then a 10cm board, which would be supported by plastic dowels hidden in the bottom cake so that the tower didn’t sink, then a polystyrene cone, from which I had chopped off the bottom section. I inverted that section and chopped it down with a craft knife to make that beamy supporty bit under the house. (That’s an architectural term. Ask anyone.) Then there was a board for the house cake, through which I’d made a hole for the wooden spike to go into the house to ensure it didn’t fall off. Technical, eh? Back to the cake. 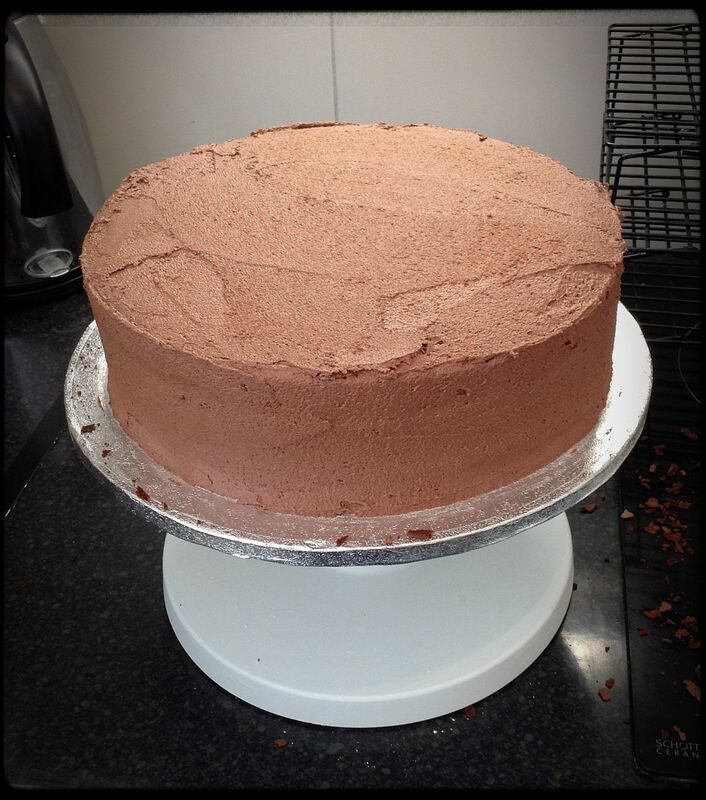 Next, I knocked up a bit of chocolate buttercream (600g icing sugar, 200g unsalted butter, 80g cocoa, 80ml whole milk), sandwiched and covered the base cake. 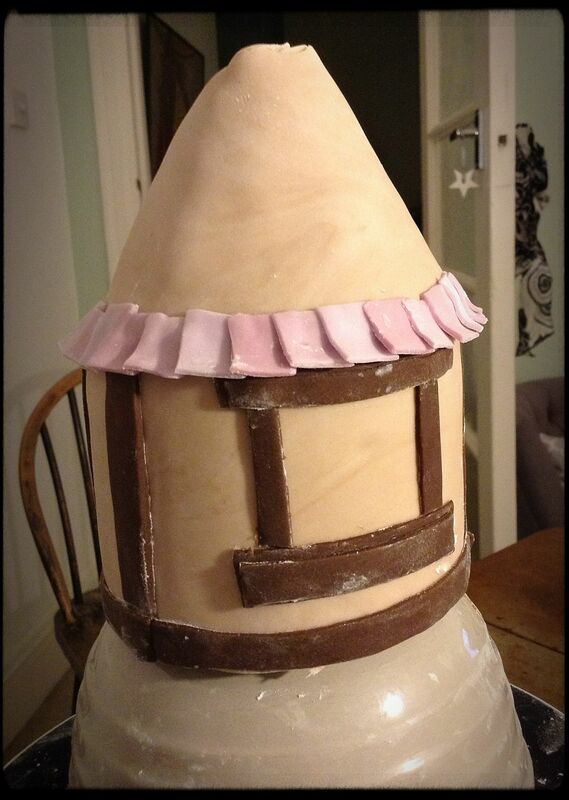 I shaved a bit off one of the 10cm cakes to make the roof, then sandwiched and covered the house too. Ah. 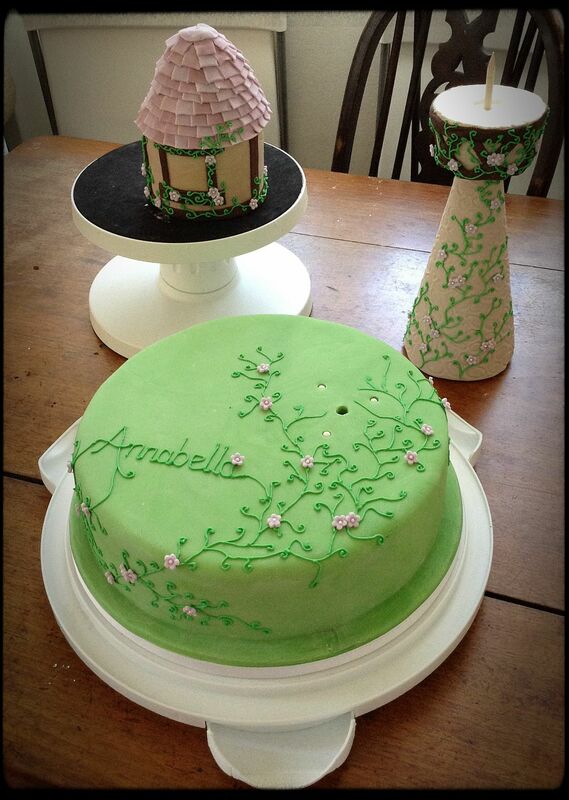 Fondant. My NEMESIS. I’d mind less if it tasted nice, but it looks and tastes like sugary Plasticine and is much more difficult to manipulate. Flippin’ ‘orrible stuff. Looks good, though. 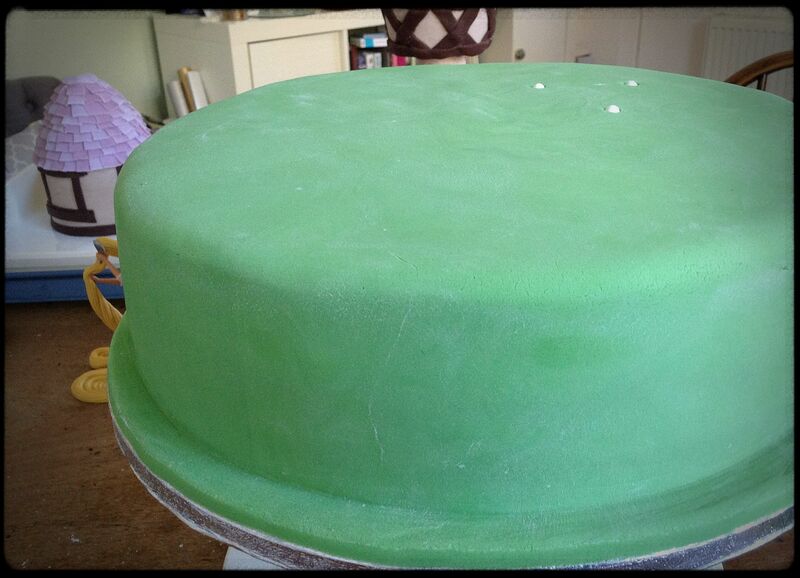 I mixed 1kg white with 1kg obnoxiously bright emerald green and got a lovely muted green colour. I think a total of 1.25kg would’ve been enough as I have a shed-load left over but I’m paranoid about needing to roll the stupid stuff too thinly so I always overcater. Next up, covering the tower. I mixed a little chocolate fondant (by Renshaw, in case you’re interested) with white to make a stoney-beige colour, then painted the polystyrene with egg white to make it stick. 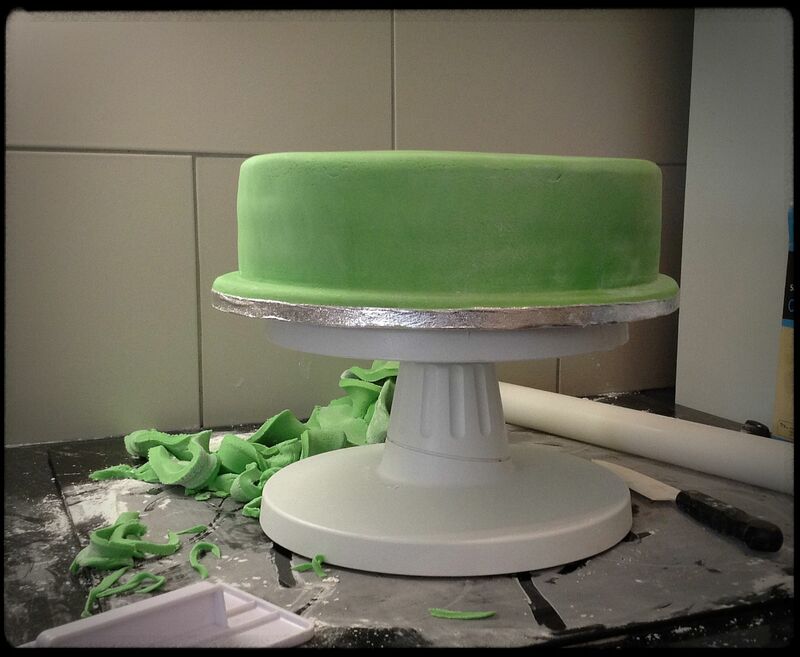 I rolled the fondant quite thinly and rolled the polystyrene over it rather than lifting and draping the fondant. I ran a knife along the join to cut through both overlapping bits and removed the excess from each side to make a sharp seam. 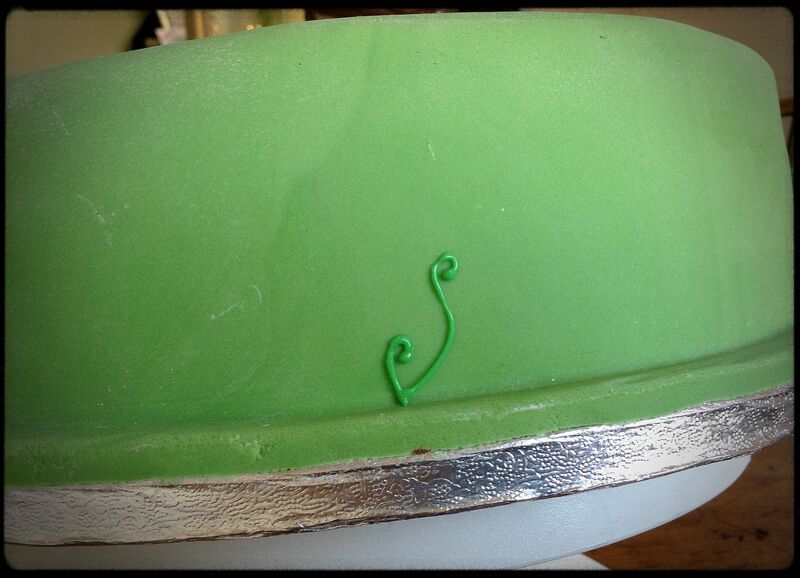 I then took a pin (such high tech equipment – what a pro) and used the head to make stone shapes in the fondant. I covered the house pretty roughly, knowing that the rough bits would be covered by beams and other decoration. Whilst making said decoration, the eagle-eyed among you will notice that I watched “Footloose”. A classic. 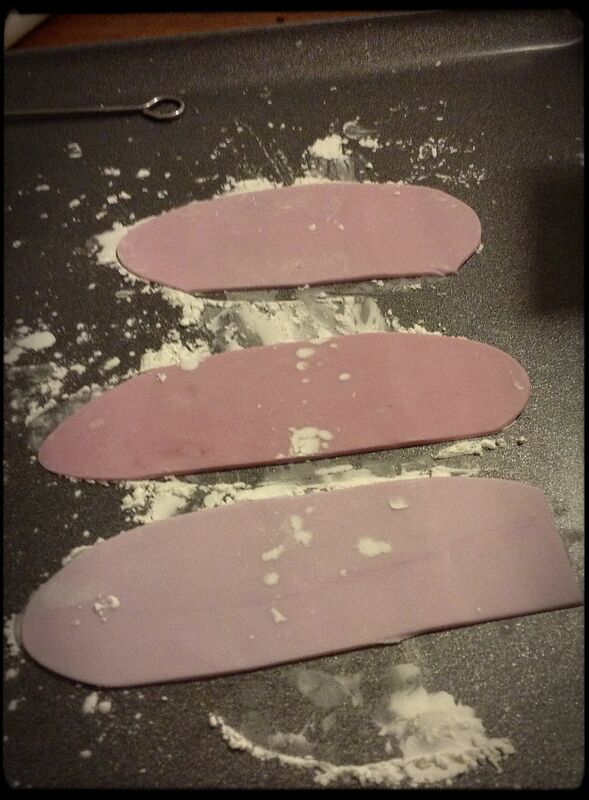 Next came three shades of lilac for the roof tiles, which were individually cut and brushed with a bit of egg white to stick them on. 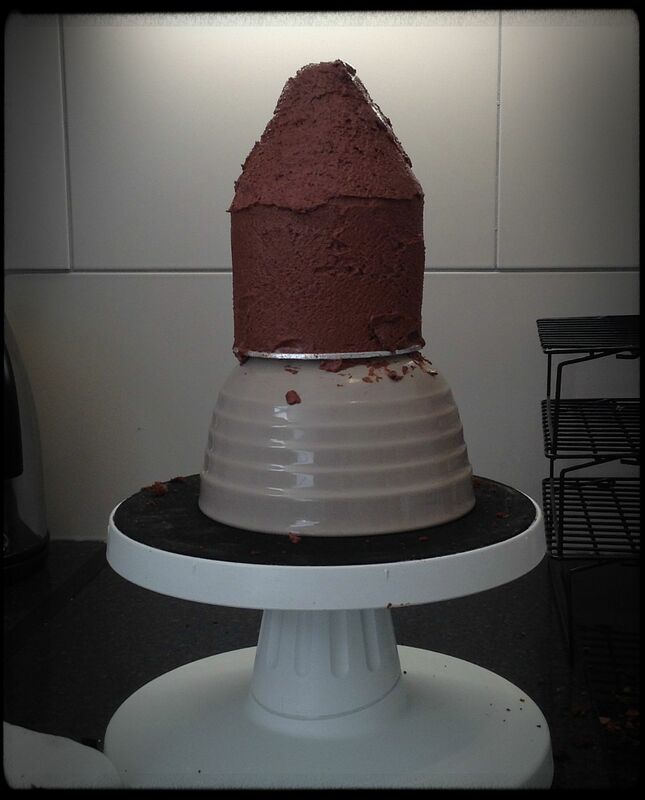 I decided where the tower would go and sank the plastic dowels into the base cake so that I could see its position while I decorated. Then I whipped up a batch of green royal icing ready to pipe (1 large egg white, 250g icing sugar, 2tsp lemon juice, green gel colouring). I did spell it right, right? 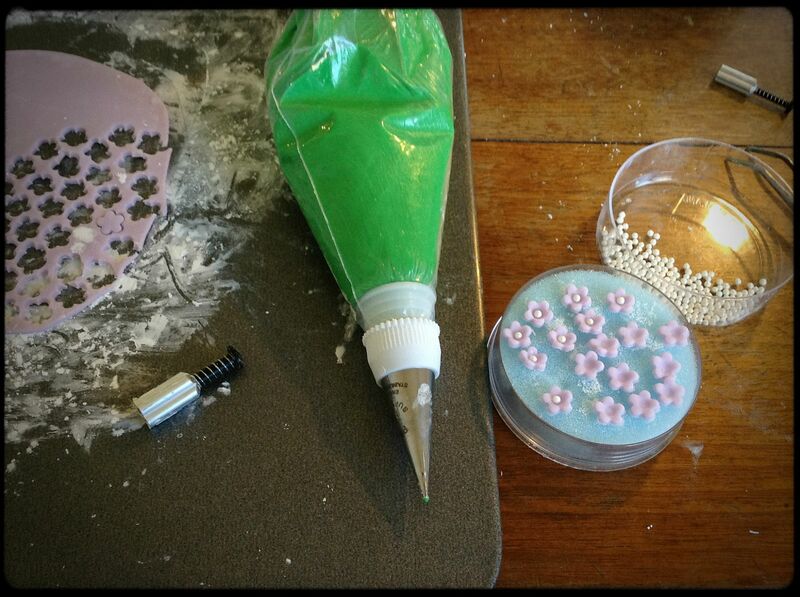 Another batch of lilac fondant, a plunge cutter, a paintbrush, some edible glue, a pair of tweezers and a little pot of tiny edible pearls, and we have pretty flowers. One of the best things about small children is their honesty. They have absolutely no filter. Bella’s comments? 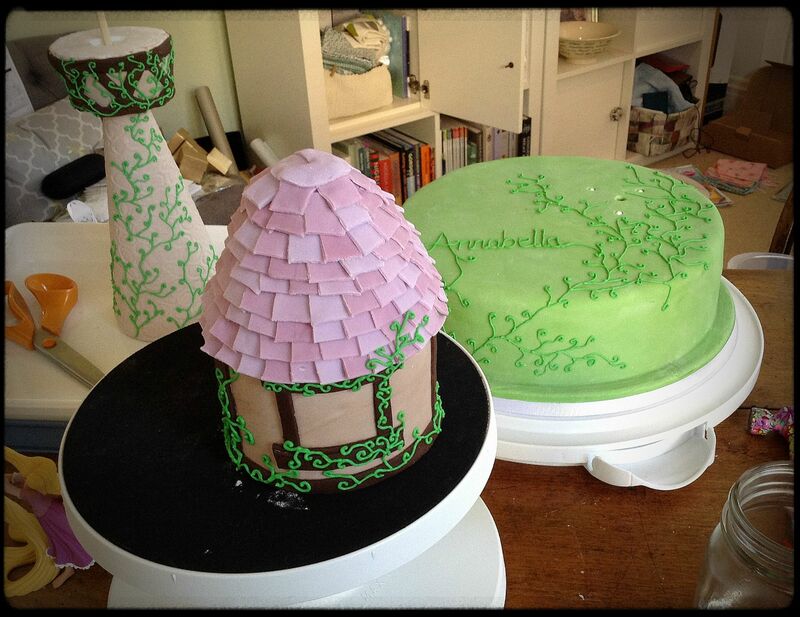 “Where’s the glass in the window?” “Why isn’t Rapunzel in the house?” “Where’s Flynn Rider?” Later, though, I overheard her chatting with her little buddies whilst looking at the cake and claiming “I’m going to eat the Rapunzel bit. That bit’s for me because I’m the birthday girl.” Well, she’s made of plastic, my tiny friend, but feel free to give it a go. Later still, she told me, “I don’t like the icing. I’ll just eat the cake.” A girl after my own heart. 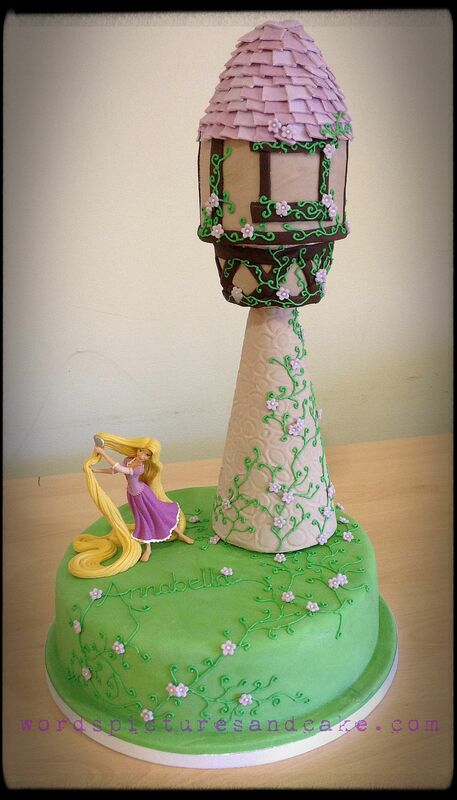 This entry was posted in Cooking & Baking and tagged 4th birthday cake, Disney Tangled cake, Rapunzel cake by wordspicturesandcake. Bookmark the permalink. Wow, what a fabulous birthday cake, Helen. 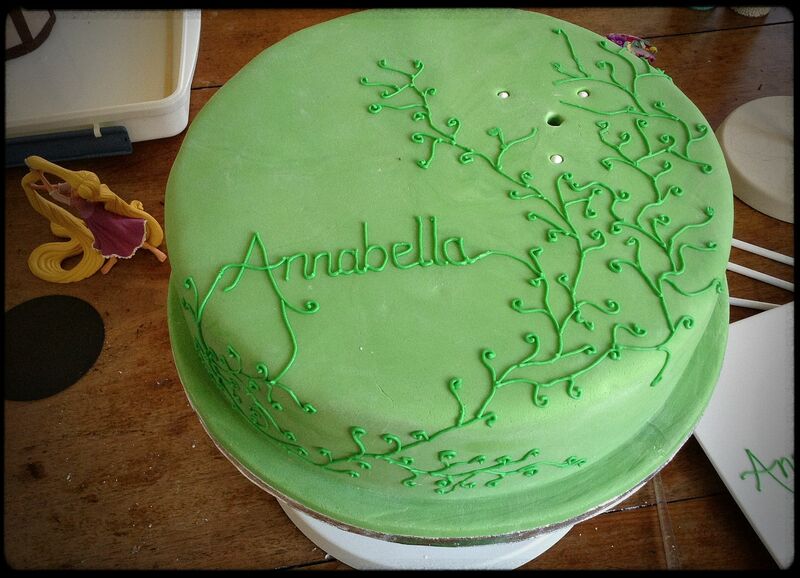 Rapunzel was a legend, so are you and your amazing cakes! 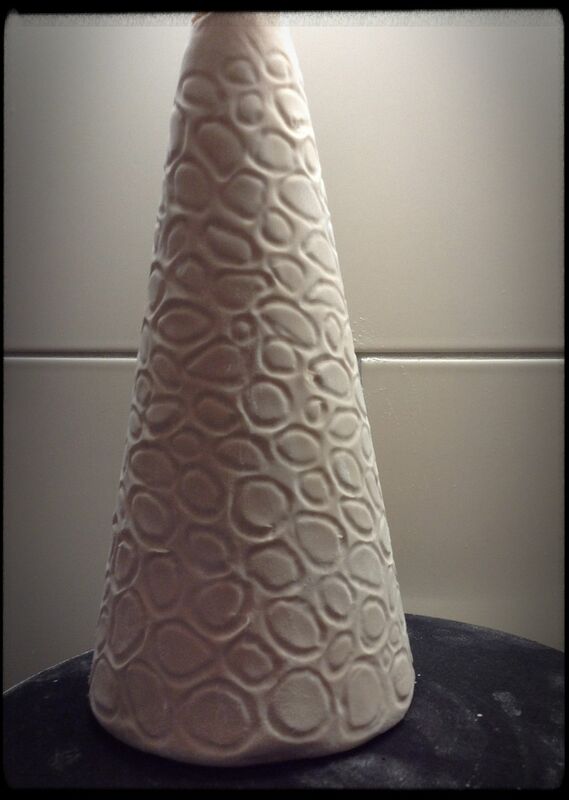 So artistic and very much admire your infinite patience….. Thank you! To be honest, I can’t exactly remember how I divided it, but I think it was probably a half batch for 2x25cm sponges, then another half batch for 1x25cm + 2x10cm. 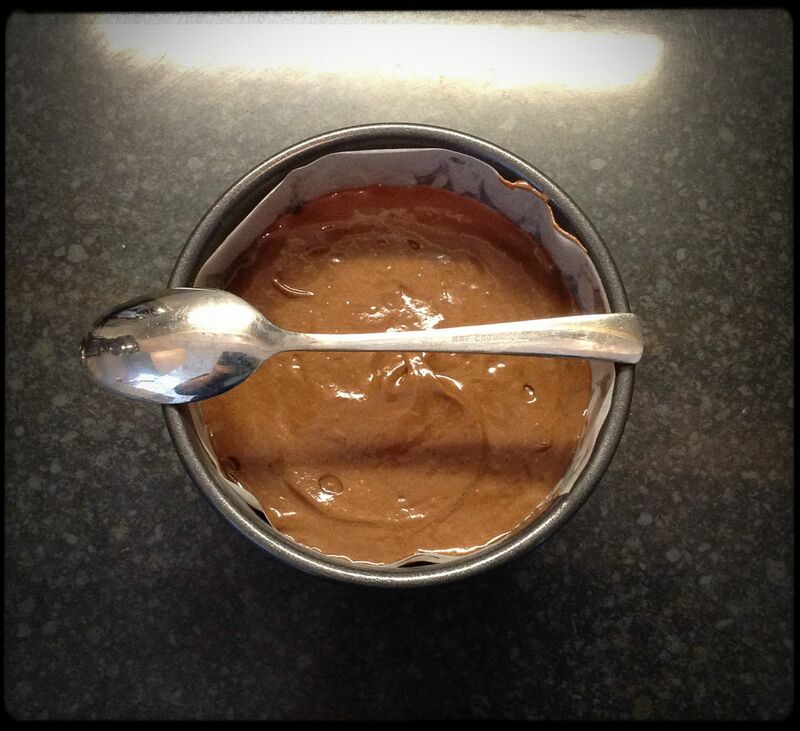 Just be careful to fill the single 25cm to the same level as the first two. Does that make sense?